If it is required our experienced ecologists will survey the given site for amphibian signs and potential by assessing the site with a preliminary visual survey. If this initial survey indicates a potential for amphibians, further surveys may be arranged by installing and inspecting humane traps to determine the species type and number. If the survey findings indicate the presence of amphibians and it is considered that the proposed activity is reasonably likely to result in an offence (killing, breeding site destruction, etc) a license will be required. Bluebell Ecology will assist you to apply for a license to Natural England which will permit the action that is otherwise unlawful and assist with the mitigation strategy. The two key amphibian species, that of great crested newt and the natterjack toad. The natterjack toad's distribution is localised and defragmented but has recently seen its status as stable after years of decline. The great crested newt, however is widespread across England but rare in the north and west of the country. 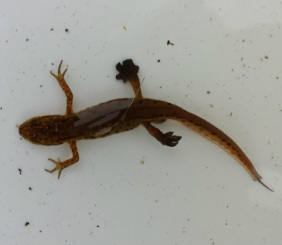 Due to habitat loss the great crested newt population is now in decline. The pool frog, common toad, natterjack toad and great crested newt are listed as a priority species under the UK Biodiversity Action Plan (BAP), that will now be replaced by the UK Post-2010 Biodiversity Framework﻿﻿. which is terminated by metamorphosis into a juvenile which has a completely different morphology and lifestyle. The pre-metamorphic stage is dependent on an aquatic environment; the post-metamorphic stages include long periods living on land. During the terrestrial period, amphibians are heavily dependent on water because they have a permeable skin which make them prone to desiccation, although tolerance of arid conditions varies between species. Amphibians typically require wildlife ponds to survive. The great crested newt, northern pool frog and the natterjack toad, are fully protected under Schedule 5 of the Wildlife and Countryside Act 1981 (as amended).